Workingservicedog.com is a Service Dog and Emotional Support Animal equipment manufacturer based in the US with offices in Bradenton, Florida. We are proud to offer gear to dog owners around the world. We are dedicated to producing the highest products as well as offering outstanding customer service. 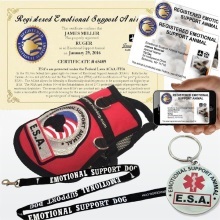 Working Service Dog was established in 2009 and has become a leader and an authority in all things regarding Service Dog and Emotional Support Dog gear. 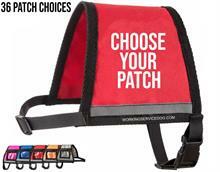 We offer the largest selection of service dog vests online. Each of our vests are designed with purpose. 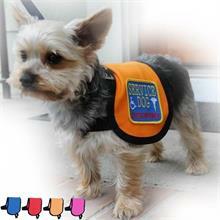 We carry a padded Service Dog Vest for the Service Dog that will be working on cooler weather. For the working dog in warmer climates we offer a mesh Service Dog Vest, this harness is built with mesh sides to allow for airflow, keeping your Service Dog comfortable in hot weather. Also available, designed exclusively for the smaller dog, is our looser fitting comfortable cape style vest. Working Service Dog specializes in outfitting the smallest Service Dogs, like a Chihuahua / Chiwawa to the largest of Service Dogs such as a Great Dane. WHY IDENTIFY YOUR SERVICE DOG? Although the ADA clearly states Service Animals are not required to have any type of identification people often find it’s invaluable to distinguish their dog as a working dog. 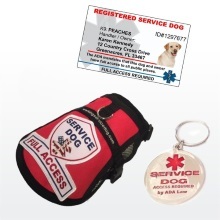 The latest addition to our product line are Service Dog Kits. 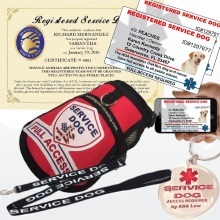 We have captured the basic Service Dog products handlers are looking for in an affordable package, packages include your choice of Service Dog Vest style, a Service Dog ID Badge and a Service Dog collar tag. 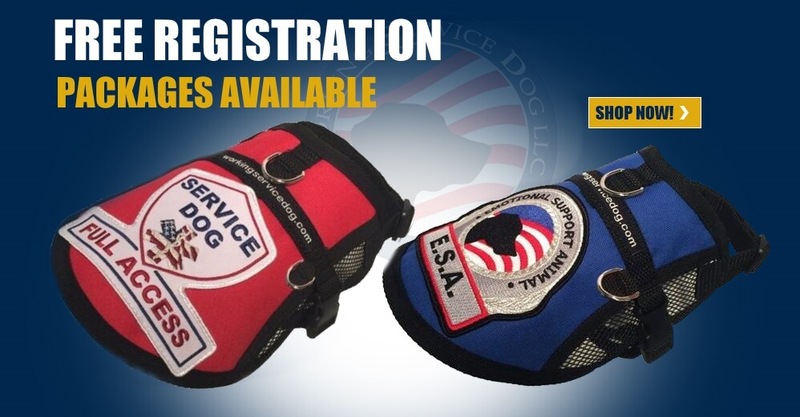 If your dog is still a Service Dog In Training we offer many products to let the public know that he or she is on its way to becoming a fully trained Service Dog. 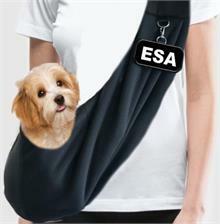 We have also recently added an Emotional Support Animal Kit. 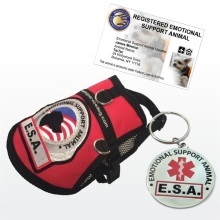 The ESA kit includes an Emotional Support Dog Vest, an Identification ID card and an ESA tag. Both kits listed above include free Service Dog Registration or free Emotional Support Animal Registration. Your animal will be provided a registration number and will be listed within our database for the life of the animal. Though many people would like to bring their pet dog into businesses and public spaces that do not allow pets it is in fact considered fraudulent to represent a non-service animal if it is not. If you are unsure if your animal qualifies as a Service Dog or if you have further questions or are seeking information about service animals, we encourage you to call the U.S. Department of Justice's toll-free ADA Information Line at 800-514-0301 (voice) or 800-514-0383 (TDD).